Premium-quality micrograin solid carbide bit is precision ground for an extra-fine finish with maximum sharpness and edge retention. 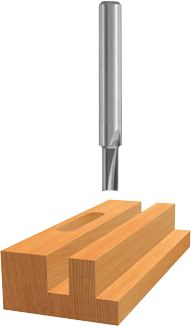 Double flute allows for a better finish in harder materials, while solid carbide gives best rigidity and long life. 85617M 1/4" 1" 1/4" 3"
85214M 3/16" 7/16" 1/4" 2"